It is very important to teach our children about dental care from a very young age… However, especially for new parents, this topic can hold a lot of questions. How do I take care of teeth that are not even there yet? What do I use to brush the teeth that do come in? Do I need to brush baby teeth at all since permanent ones come in? These are all very valid questions. Continue reading to find out how best to take care of your children’s teeth. How to take care of their teeth before they even begin teething. All you need for this is a very soft baby washcloth and some warm water. After feedings, wrap the damp washcloth around your finger and gently rub your baby’s gums clean. Leftover milk can still cling to gums and create problems for the baby teeth when they come in. It is just as important to keep gums free of bacteria as it is teeth. Speaking of teeth, when they begin to come in, you can start using a very soft bristled brush on the teeth themselves. Also just with warm water—no toothpaste yet. Continue massaging the gums clean and using the brush on the teeth as they erupt. This will be a difficult time for your little one since teething is a painful process. So be gentle–but consistent. Within six months of that first tooth cutting through, or by the time they turn one, its time to make baby’s first dentist appointment! The dentist will be able to inspect your child’s teeth and gums and detect any underlying issues. You can also begin talking about what you can do if your child develops an issue such as constant finger or pacifier sucking… These habits can impact the way teeth grow in and cause future problems, so it is a good idea to have a game plan for how to stop them early. Keep your visits regular, and your dentist will be able to help you see and teach your child how to maintain proper dental care. Ask your dentist about a good child formulated brand to use. 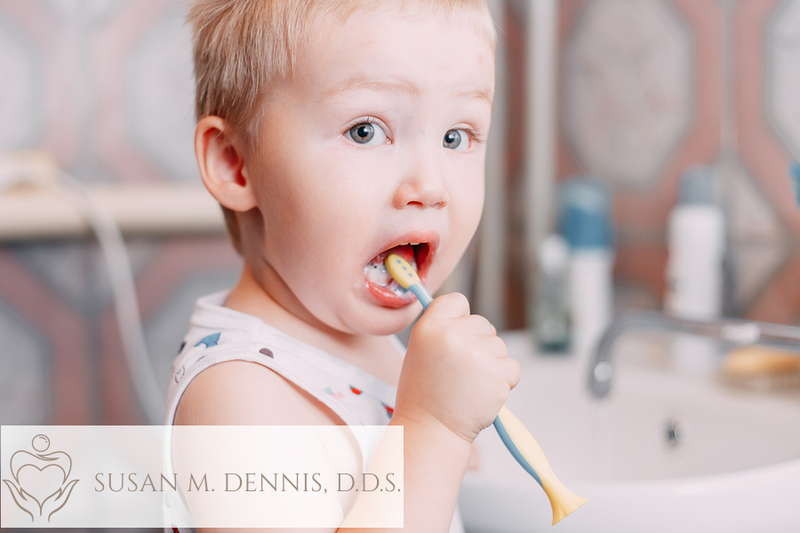 Still using a soft bristled brush, use a very small pea sized amount and let them begin learning to brush their own teeth… Be sure to supervise until their hand eye coordination is consistent. Also, be sure they do not swallow the toothpaste. Teach them to spit it out when they finish, and that brushing is what to do after they eat. You can also turn this time into a family bonding experience by all brushing teeth together after meals. This will teach the habit, as well as make it a positive experience for your toddler. Sleeping with or constantly having a bottle on hand can actually harm their teeth… Going hours with a constant supply of milk or juice will turn your child’s mouth into a bacteria and cavity machine. Set a schedule, and stick to it, especially once they can begin drinking juice and other sugary drinks. Even if they really want it, they do not know the effects like you do… So remember what is best for them and use your judgement to be sure they always have healthy teeth. I hope this has helped you learn how to handle infant and toddler dental care! Remember to keep those dental appointments regularly. Make this habit a positive experience, so your child will always have healthy teeth–even when they are all grown up. Coffee… is it that bad for your teeth? Give Us Your Halloween Candy!